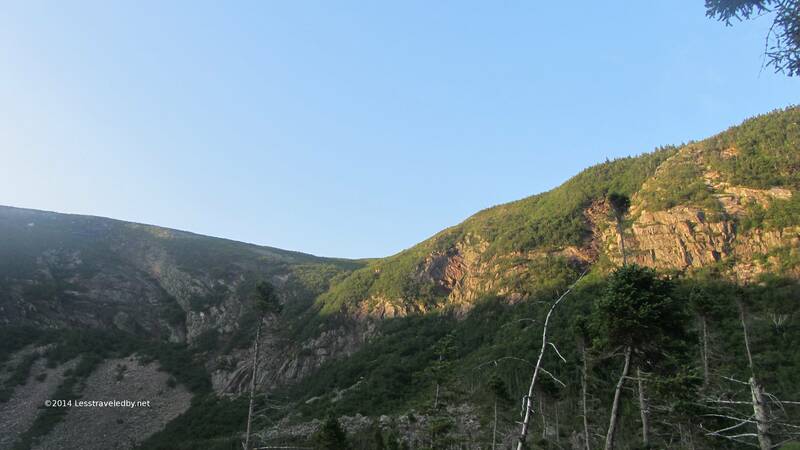 Day 1: Enter via Togue Pond Gatehouse (South entry) Park at Roaring Brook camp and climb Chimney Pond Trail 3.8 miles to Chimney Pond. 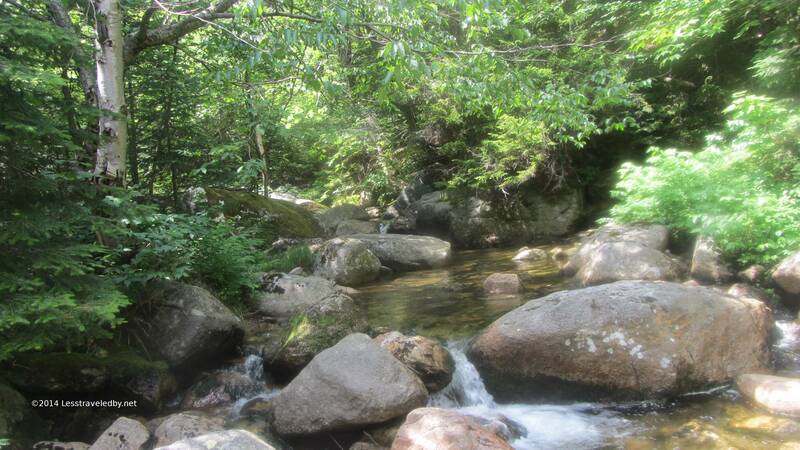 Day 5: Wassataquoick Stream LTs to Roaring Brook camp est 5.8 miles. This trip has become an annual tradition. I’m barely home from this year’s trip and already pondering who I can convince to go with me next year. Taking someone new each year reminds me just how special this route really is. They also remind me just how treacherous it is which helps keep me safe. This rough elevation profile shows the excitement of day two, but don’t discount the thrill ride the first few miles of day three provides. After that the trip is relatively casual and relaxing which is really appreciated after the hard work early in the trip. Note: Both the map and elevation profile above are rough estimations of the route actually taken. They give you an idea of the area but should not be taken as gospel in terms of distances and elevations. 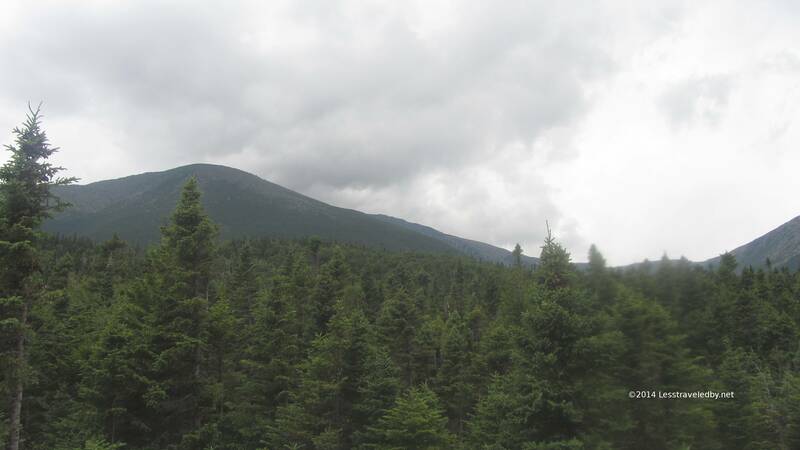 The Roaring Brook parking lot is usually pretty full by the time I get up there around noon after the long drive. 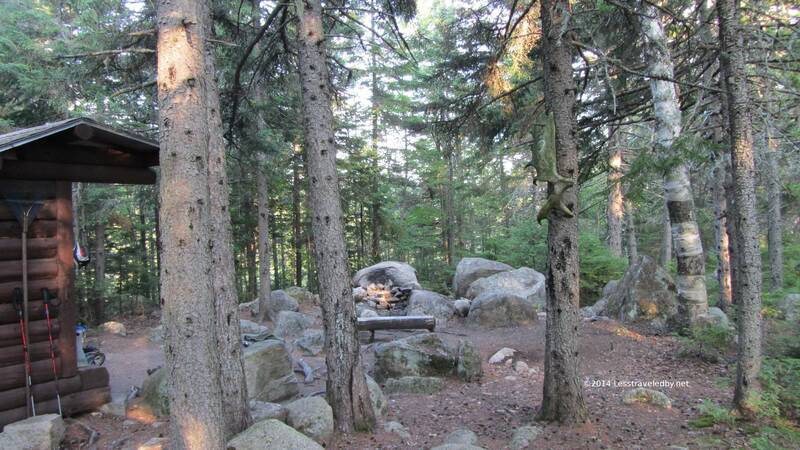 There are some camp sites there on the brook as well as some great low elevation day hiking trails so there is a mix of people. 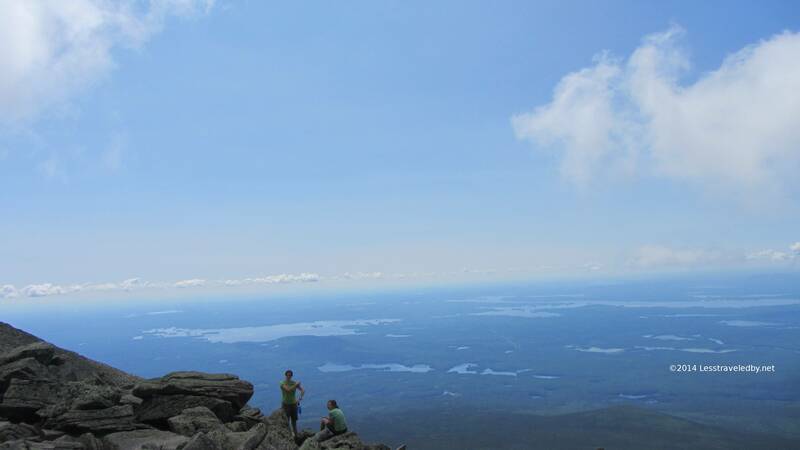 Many are here to day hike Katahdin or to camp just below the peak at Chimney Pond. 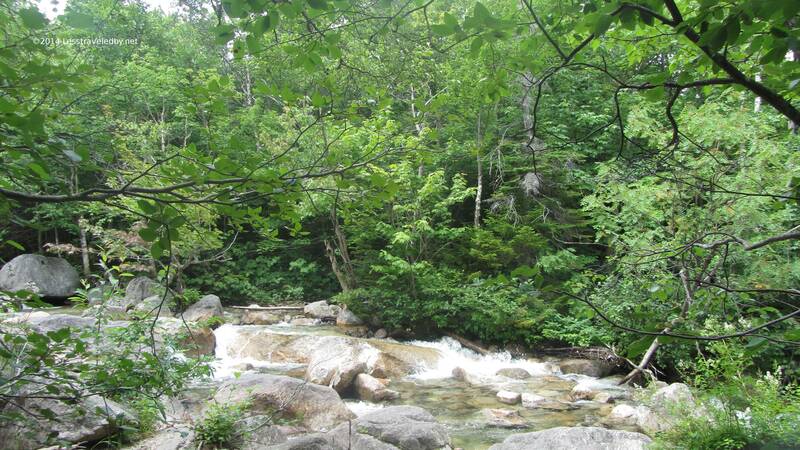 Roaring Brook runs right along the trail for the first sections. Even running somewhat low it still makes a nice sound. 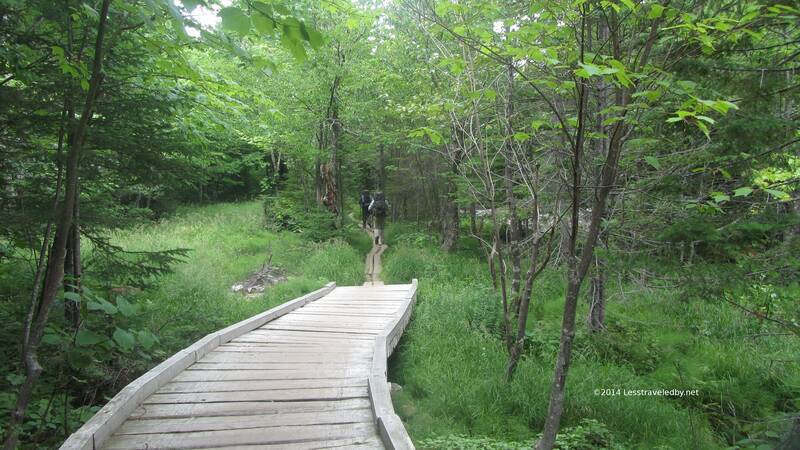 This trail is not the busiest route towards Katahdin, but it does see a huge amount of traffic. For that reason the park has built a lot of structures to protect the more sensitive spots. Way beyond just bog boards some areas have bridging like this. A bit intrusive to the park’s “Forever Wild” ideal, but necessary to keep all those footsteps from tearing up the trail. 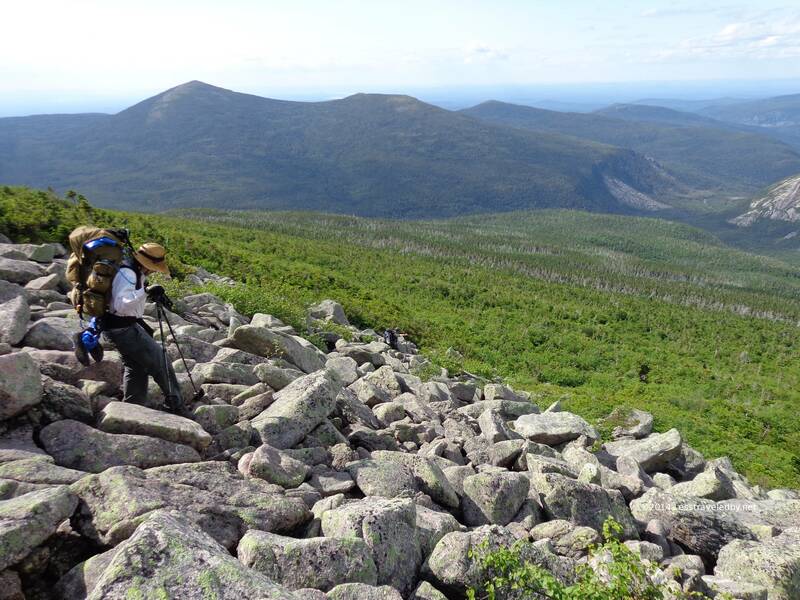 We stopped at an open area beside the trail where Katahdin and Hamlin could be studied from closer up for the first time. Weather was closing in so the views were a bit ominous. 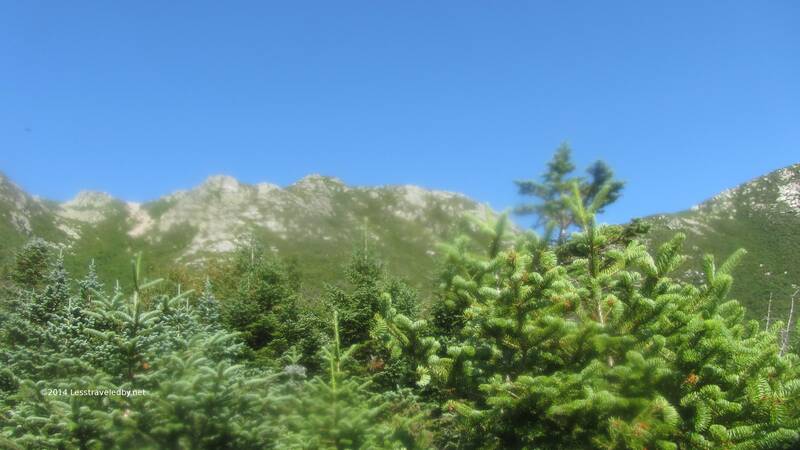 Looking from this side Pamola almost eclipses Baxter Peak. 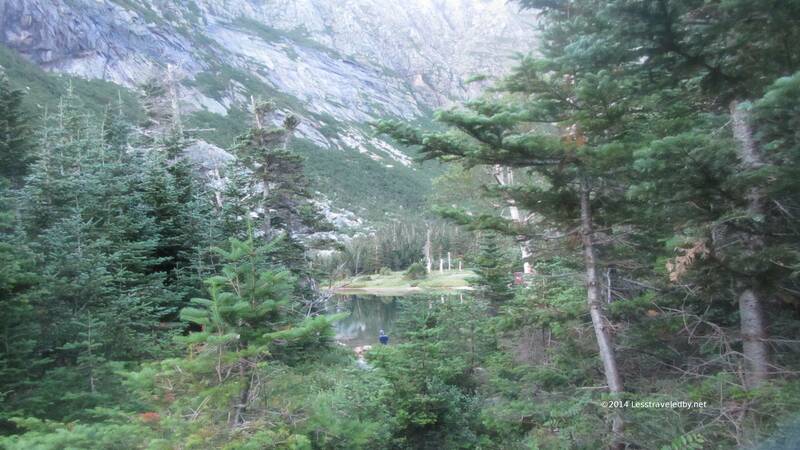 The bear line in the Chimney Pond camp area is always full as is the camp. 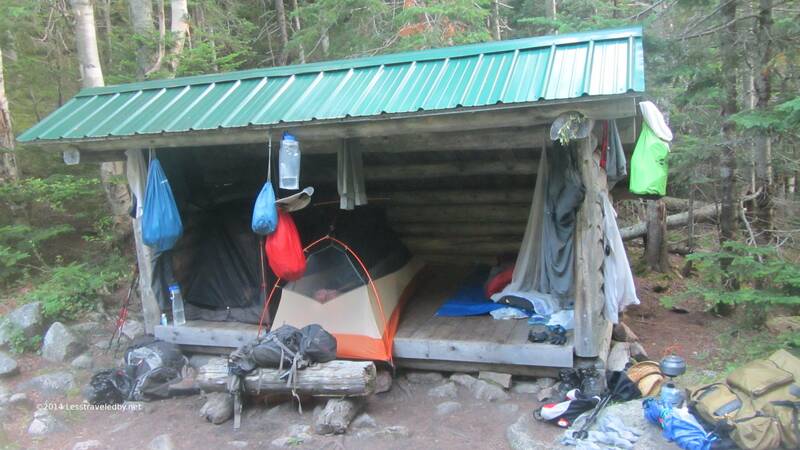 There are nine lean tos and an eight person bunkhouse here along with a ranger station and a crew camp. We were really lucky to have a quiet group for our stay here this year, but that isn’t always the case. 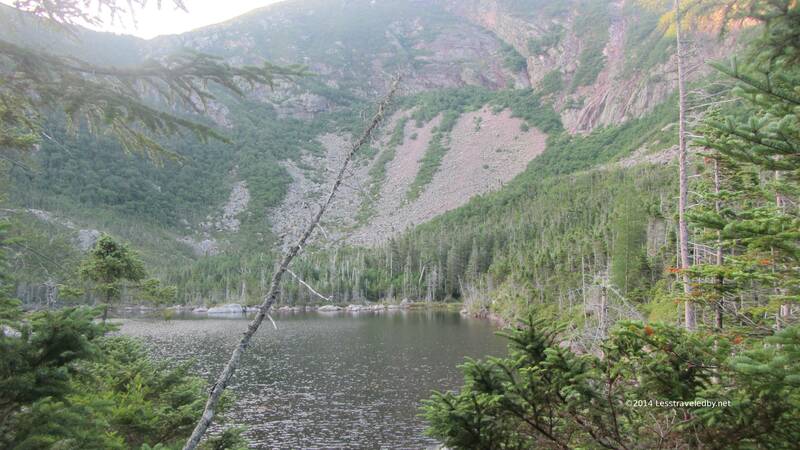 Chimney Pond lies right on the border of the alpine and sub-alpine zones. Winters here see huge amounts of snow and the summers are short. The pond itself is very shallow, but crystal clear. 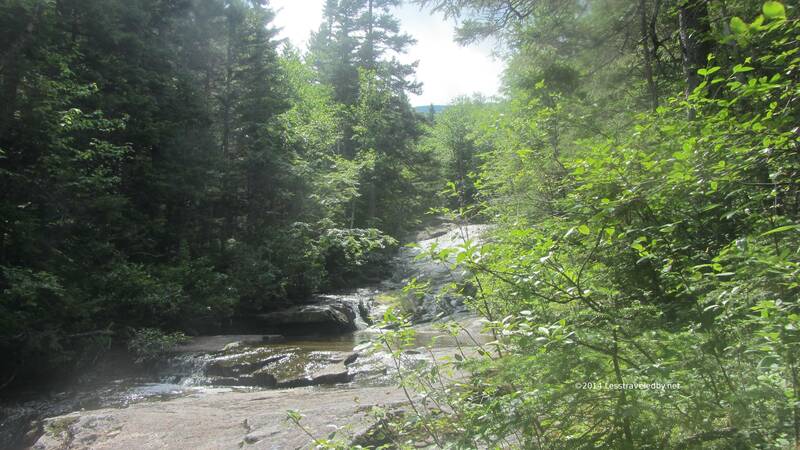 Used only as a water supply folks wanting to cool off are directed to a rock strewn overflow pond near the bunkhouse. Of course it is also used as the subject of a few million pictures each year I’d imagine. We got an early start the next morning so we could get the climbs out of the way before it got too hot. The rain the night before left the scrub forest feeling steamy even with the cool temps so we were happy to start breaking out of the tree line and feeling a breeze now and then. The Saddle Trail becomes a boulder scramble once the trees give way. The distance is not long measured in miles, but this section is a series of rock puzzles to be solved so as much time is spent planning as actually walking. The thinning air may have something to do with that as time spent planning can also be used to catch your breath heh. Looking back down as we neared the top you can just make out Chimney Pond in the shadowed area towards the upper right of this shot. The signs claim it is only 1.4 miles from the pond to the top of the saddle, but no one who has climbed it with me ever believes any of the signs we see on the rest of the trip afterwards. 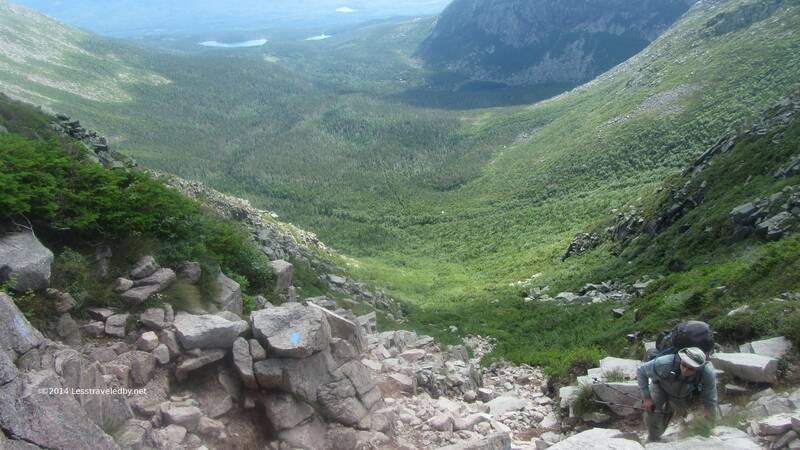 Looking towards the Knife Edge from below Baxter Peak. 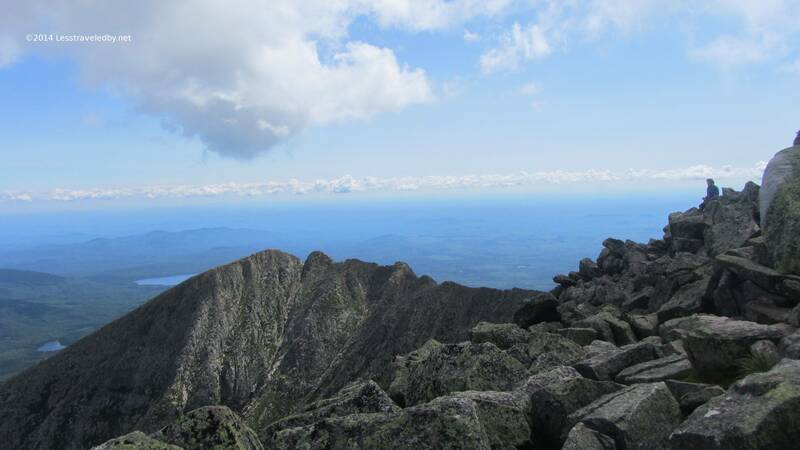 Looking towards the Knife Edge from on top of Baxter Peak. We look so serious in this shot not because we are serious mountain climbers but because there was a group of AT thru hikers celebrating their last day on the trail by being total idiots. We tried to enjoy the views we’d earned by climbing up there, but since these folks seemed intent on ruining the day for everyone who was unfortunate enough to be there that day we took a few pics and headed for the backcountry portion of our loop. 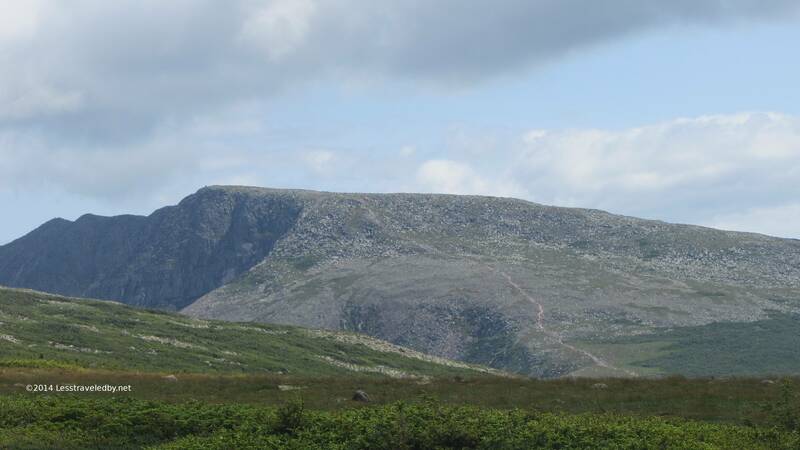 I love looking back towards the peaks as the trail heads across the tablelands. 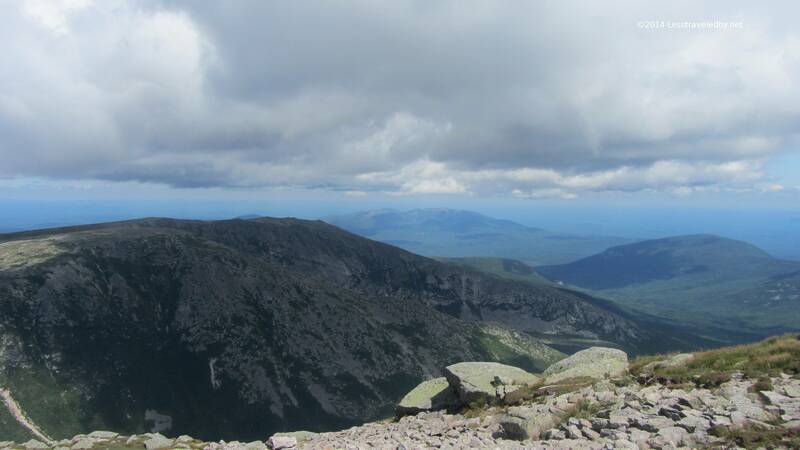 Katahdin seems huge up close and yet somehow seems to get larger as you get farther away. Life is hard on the tablelands. Shelter from the winds is one of the keys to survival. Maturing quickly is also a boon. While these flowers were still in bloom many of the grasses had already gone to seed by mid-July. 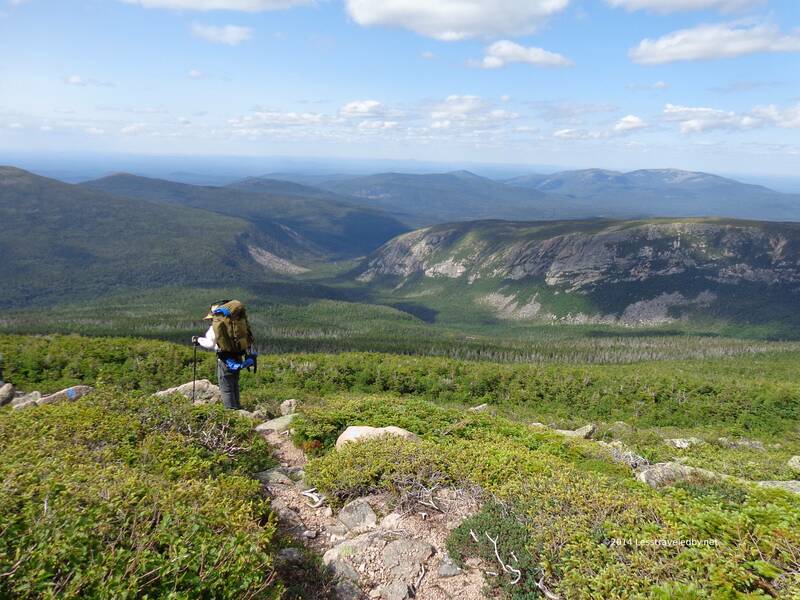 The walk across these rocky flat lands dotted with clumps of short evergreens clustered together for protection is one reason I keep coming back to do this trip each year. 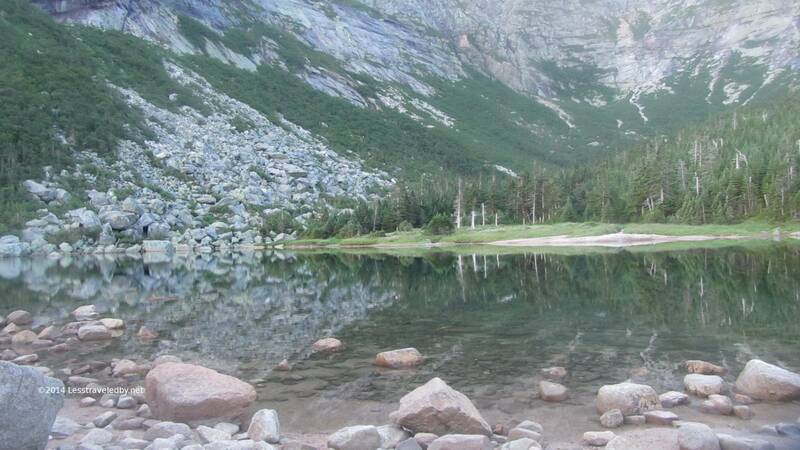 A lot of work is involved in getting there and as camping is strictly prohibited the time there is short, but so magical in its other-worldliness. A bit farther down the trail and looking back at the mountain begins to reveal just how huge it is. The trail we’d taken hours earlier is still quite clear. Like an old Hollywood backdrop this almost looks painted. We didn’t get a clear day up there, but a hazy sky can do pretty things. 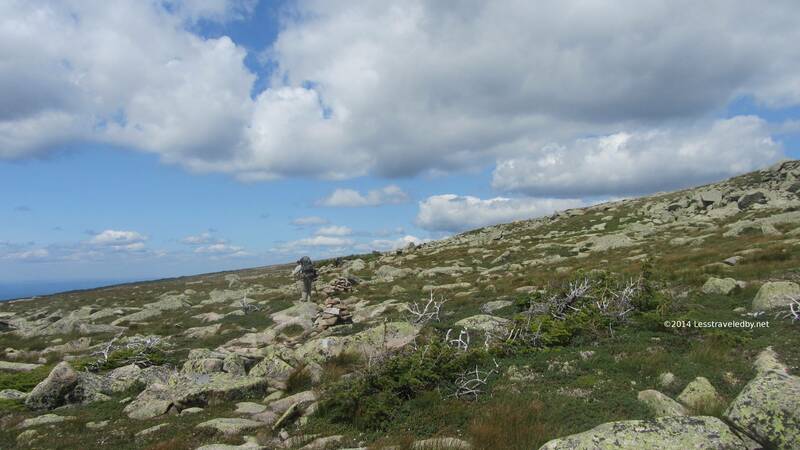 This is out towards the end of the Northwest Plateau where the winds come roaring up over the exposed ridge unhindered. 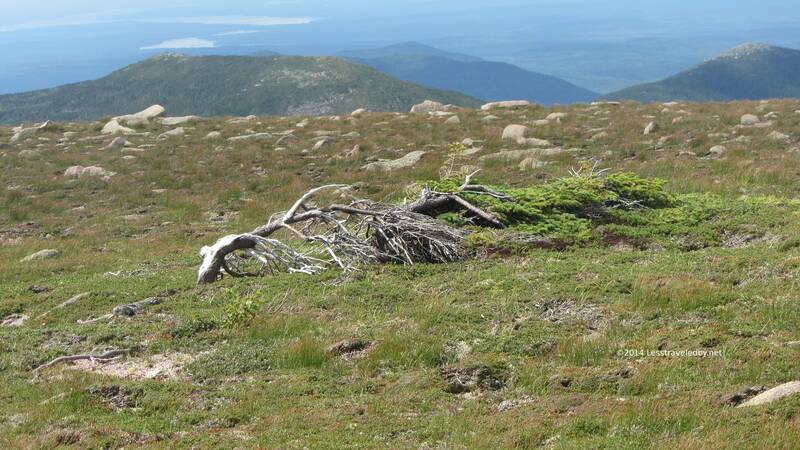 This tree found a way to survive by going horizontal but it stands alone so far. First views down into the basin. We’d be near that giant slide in the center of the shot the next day. One last look back across the tablelands towards the mountain. A final chance to enjoy what had been a great day. Now it was time for my least favorite part of this loop each year. 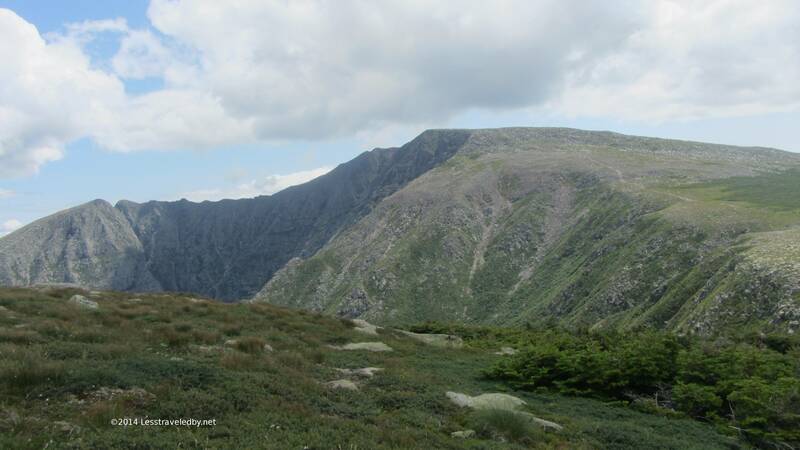 The views of the basin from the top are beautiful, but the trail down is never kind to me. It starts with two sections of boulders that are just a little too big and a little too far apart for my stubby legs. The mantra “No breaka you neck!” was repeated many times as I navigated these rocks as were a few other words I won’t share here. The rocks give way to the creeky portion of the trail which is most of it. Slippery moss covered rocks, pockets of mud and plenty of roots combined with a big elevation drop make for an incredibly slow and dangerous descent. The sign, which of course no one believes, says it is 1.2 miles. It took us about 3 hours to navigate without anyone getting killed. I’m sure it could be done faster, but the loss of life risk would definitely go up. Having survived the descent yet again this beautiful lean to was our reward. 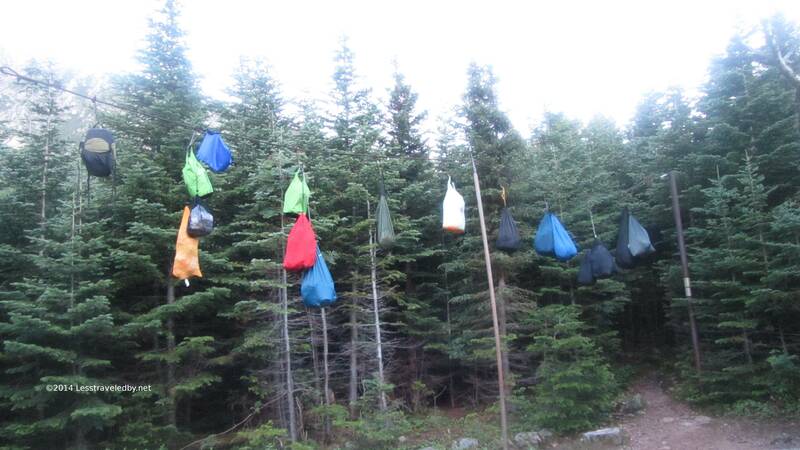 My partners used their tent bodies as bivies but I just strung up a bug net each night. 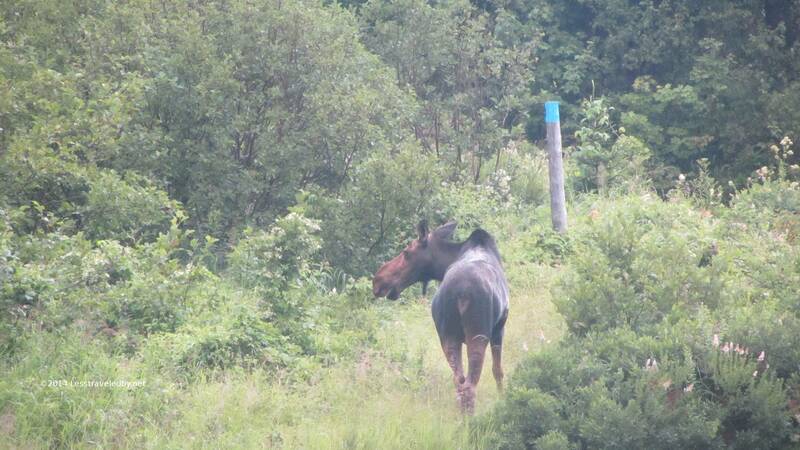 Two years ago we had a moose walk right around the corner of the lean to and stand in front of us before heading down to the pond. The sound of the waterfall varied in intensity depending on the wind but was a constant. 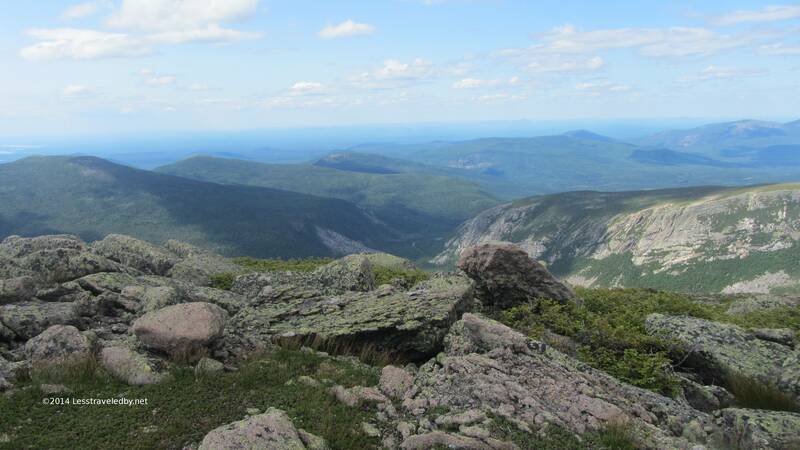 This spot is so remote it is hard to remember that just a few miles back down the trail there were crowds on the peak. Being among the people in the morning and then so alone that evening really tells a person which side of that line they belong on. I find I’m much happier here even if it is harder to get to. I would love to go explore this waterfall some day but there is a one night only limit on this camp and never enough time to do much more than eat, sleep, putter around in the morning making excuses not to leave yet and then regretfully push on. Another favorite part of this loop is the morning walk past Lake Cowles. Most years I’ll get an early start and the water will be steamy with morning mists. This year we did a good job of relaxing a bit more and while it was still early the mists had lifted. This tiny lake is perched on a somewhat narrow ledge of rock between the high ridge above and another steep drop off towards the stream below. 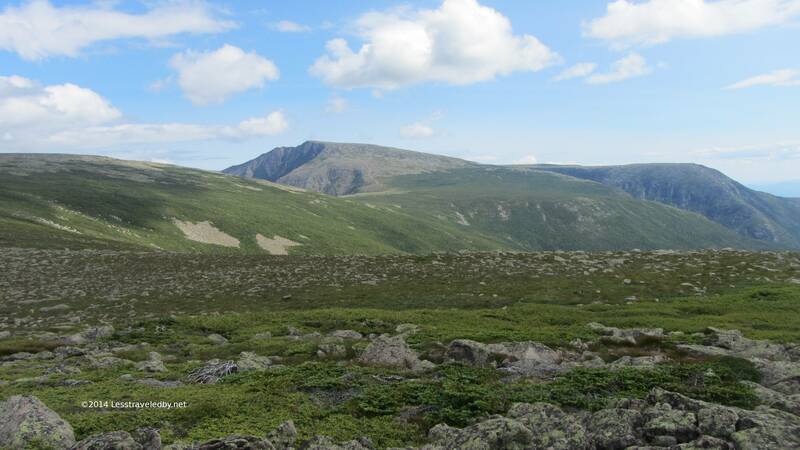 No camping is allowed in this fragile area and it really retains its sense of being truly untouched. The trail crosses its outflow providing a few views of the lake, but otherwise it is left alone to be as it always has been. This doesn’t really give you any idea of how treacherous this section of trail between the lake and the stream are but it is far too dangerous to take out a camera in the really bad spots. My nephew refers to this section as “The Water Slide” while again, I won’t say here the words I use to describe it. I almost never fall but slipped and went down twice on this section. The water flowing down the smooth rocks is great for growing moss and bringing up the rear I seemed to fair the worst. One fall was quite spectacular as I managed to toss my pole under me in just the right place for my backpack frame to land on it and take the brunt of the impact. If I didn’t know better I’d think it was an expert maneuver, but instead I keep recalling laying on my back in the water with a full pack on wondering how I’d ever stand up heh. Finally we reached the bottom of the creeky section and reached the stream. 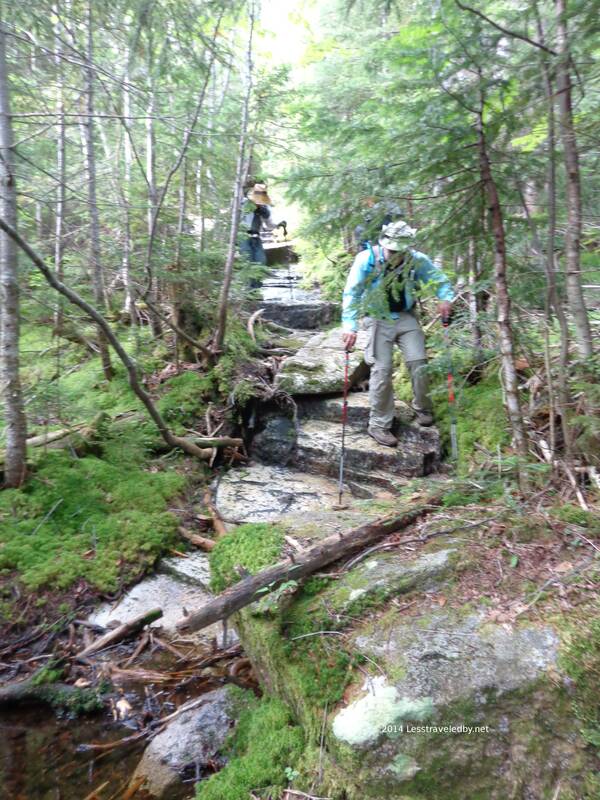 Here the trail drops all pretense and actually joins the stream proper for a few hundred yards. The first time on this loop we spent a while trying to figure out where the trail went until we spotted a blue blaze on a rock in the water. Looking back up the trail/stream you can see this section would be much more challenging during high water. I have done it in June without issue, but right after a storm you’d want to use your discretion. From here on out the trip changes from mountains to forest with lots of mosses, fungi, ferns and other water loving plants. 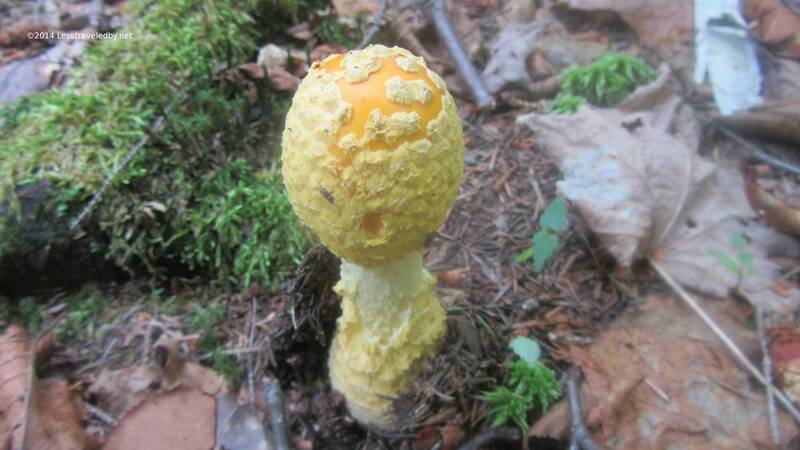 The variety of mushrooms alone is amazing even if you don’t care about their scientific names. 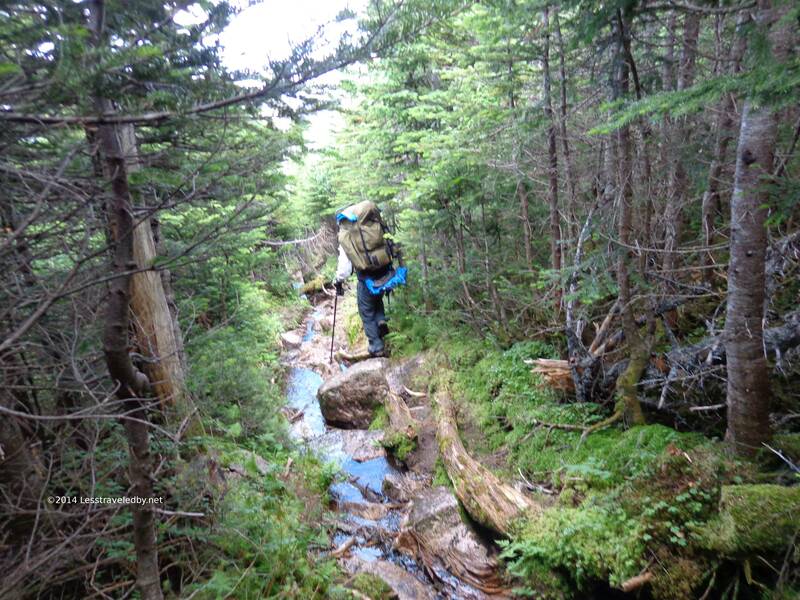 Lots of small water crossings and one big one lead on into the center of Baxter State Park. The bugs were pretty good this year compared to years past but I kept my head net handy just in case. Other years the net was the only thing keeping me alive and I highly recommend carrying one if you go anywhere that has black flies. My crew getting ready to cross the Turner Deadwater, the last water crossing before Russell Pond. Every year someone gets a wet foot on this almost rock-hoppable crossing and this year was no different. Thankfully the days hike is almost done so the wet foot is soon forgotten. The Turner Deadwater isn’t exactly dead as you can see. 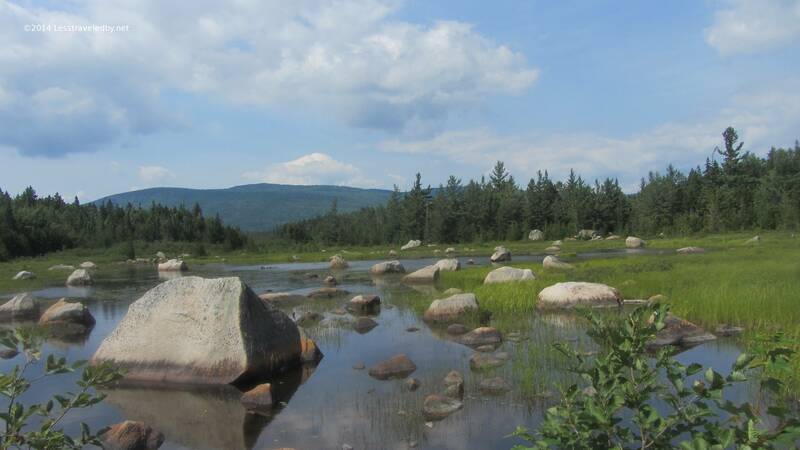 It is actually a prime moose foraging area and home to some pretty tiny trout along with lots of other wildlife. 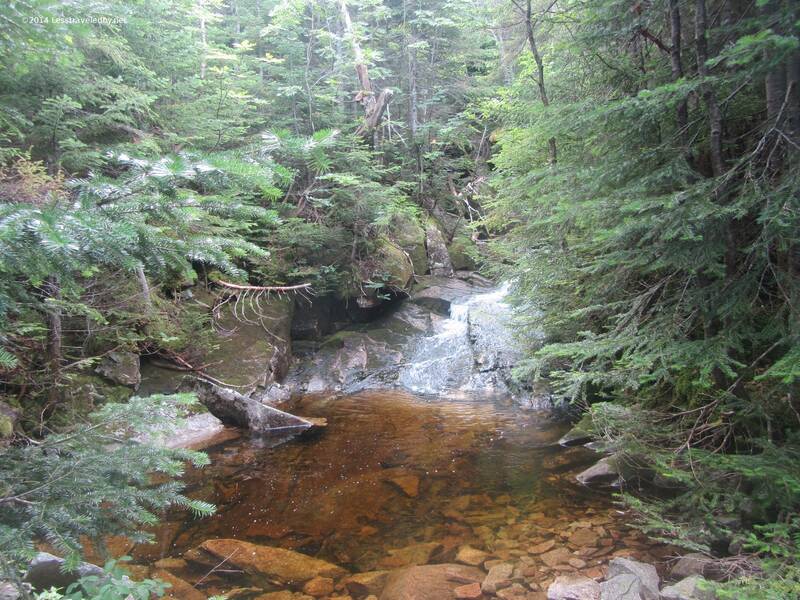 Turner Brook reforms just below this point and winds down to join Wassataquoik Stream a mile or so on. 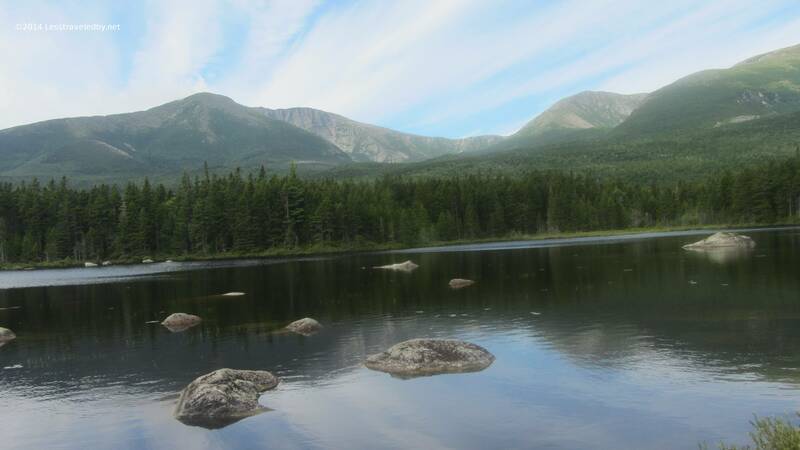 Russell Pond is another multi-site campground but has the advantage of being deep into the park. While often booked up the people here tend to be quieter though there can be exceptions. 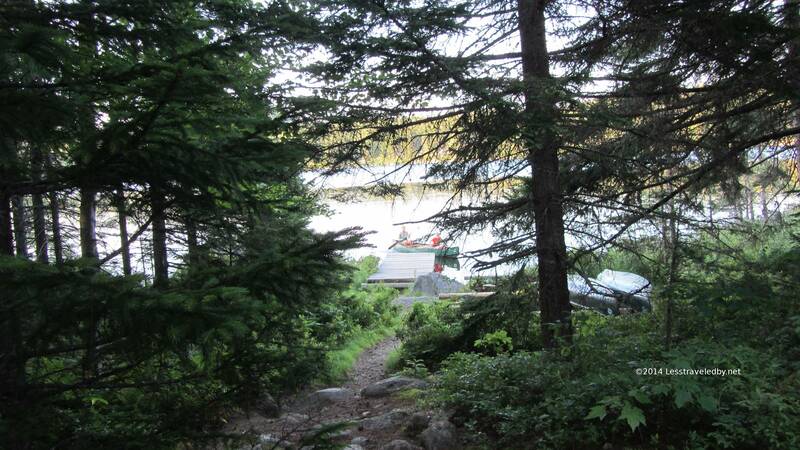 There are five lean tos, three tent sites, an eight person bunkhouse, rangers cabin and crew cabin spread along one shore of the pond. 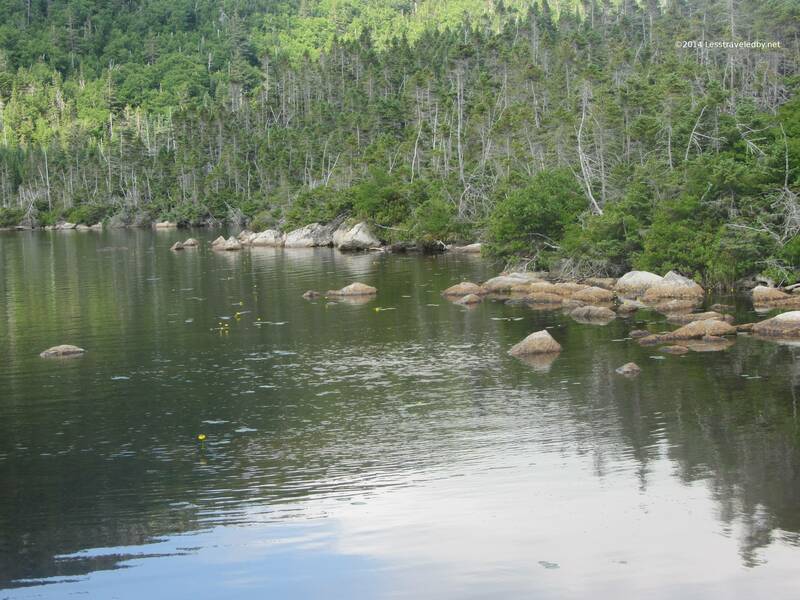 This is one of the areas in Baxter where rental canoes can be found for $1/hour. Paddles and life jackets are provided so it is a chance to enjoy a paddle without having to carry anything but a dollar or three. 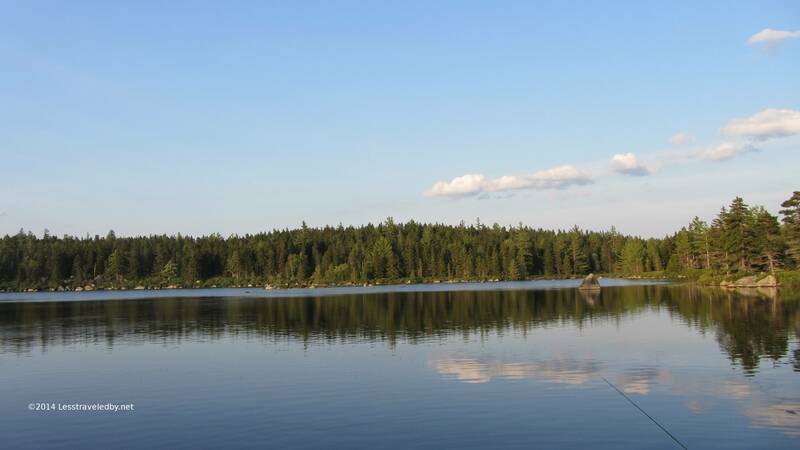 Many of the ponds that have camp sites have canoes for rent throughout the park. I again opted for the more private lean to #5. 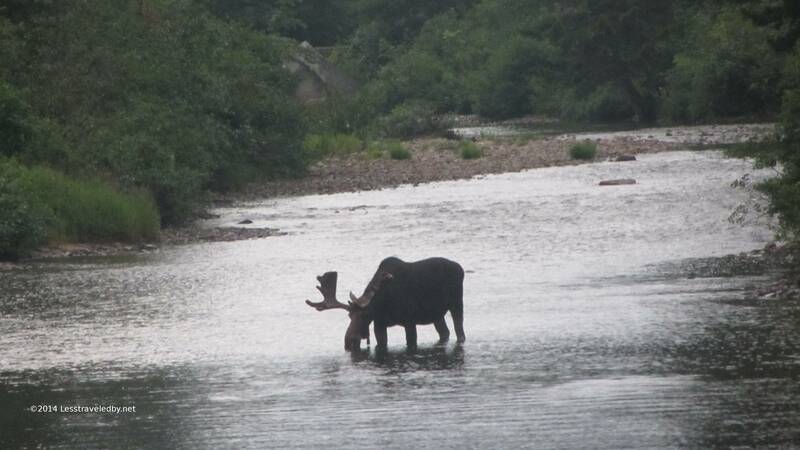 The other sites are better if you want to watch for moose. You are almost guaranteed to see some at the sites by the shore, but this one is nice and quiet if you are willing to walk way out to it. 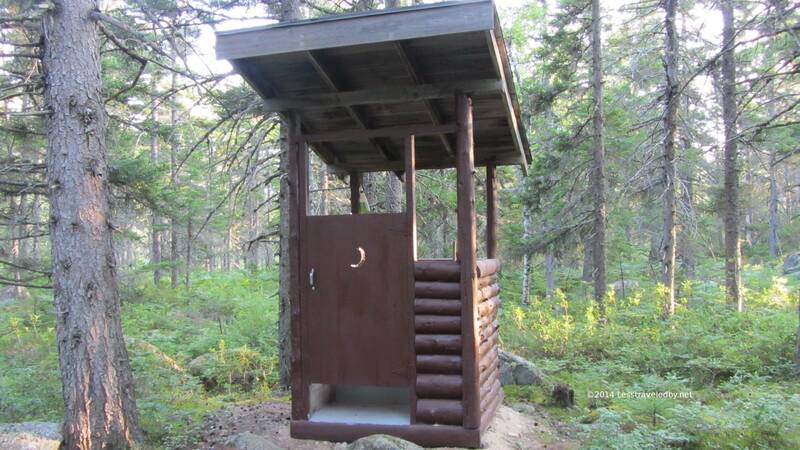 It also has perhaps the finest latrine in all of Baxter State Park or anywhere for that matter. Plein air is how like to refer to the experience though a windy rain does dampen more than the spirits. Some folks enjoying the canoes on Russell Pond in the early evening. They were a large family camping in the tent sites because they had too many people for a lean to. The pond was perfect for a family paddle that evening…or so it seemed. My partners went out the following morning and found a lot of barely submerged rocks. Good idea to be careful even in a rental! 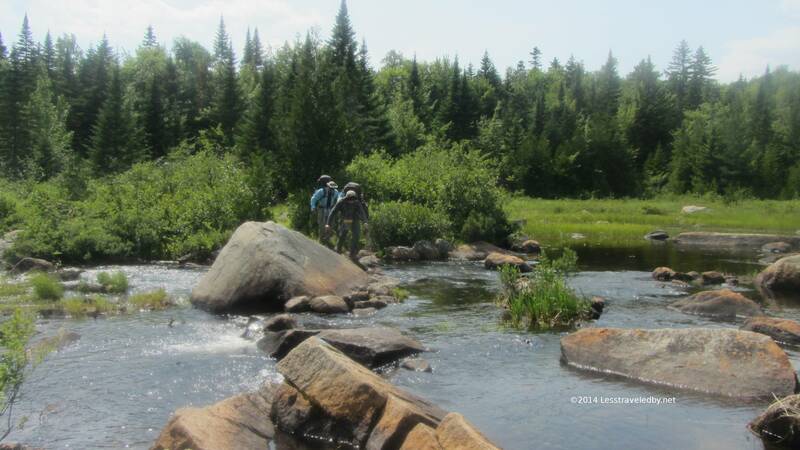 The next day we headed just a short distance down the trail to the Wassataquoik Stream lean tos. Less than two miles of easy walk meant we could sleep in, have a lazy breakfast and the boys had time for a short paddle. This day is planned as a relaxing rest day before the final day’s walk out to the car. 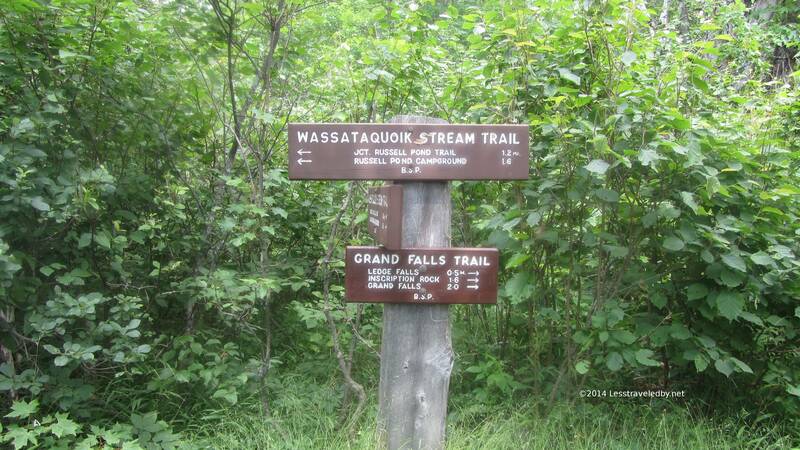 Every year I look at this sign and say “Next year I’ll go up to the falls but this year I’m just going to sit around camp, maybe do some fishing and take some pics. Boy but next year I’m going to go see them falls for sure!” Sure do wonder what those falls look like heh. Definitely the right choice to hang around camp and take pictures. 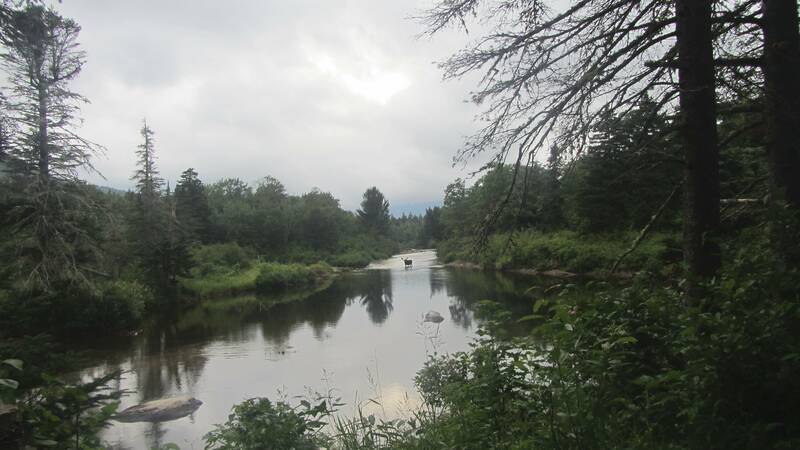 We had a light rain shower start almost as soon as we arrived and the fish weren’t biting but we did see lots of moose. 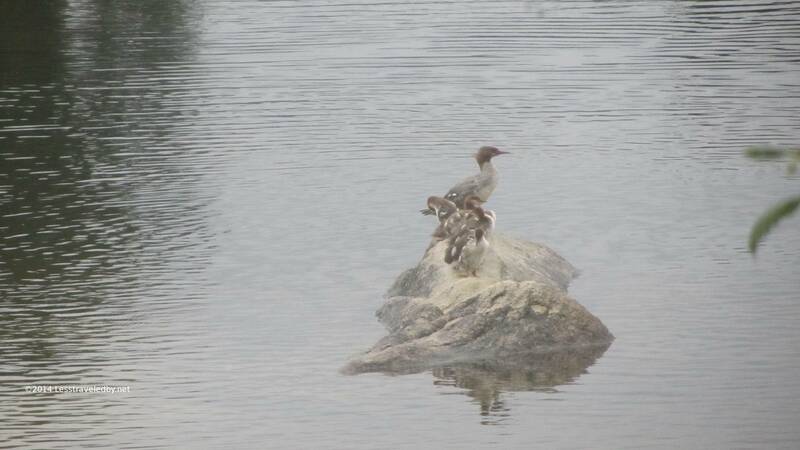 My experts (Mrs Stranger) have narrowed these down to likely being mergansers with some debate on the specifics but really, they were pretty what ever they were. 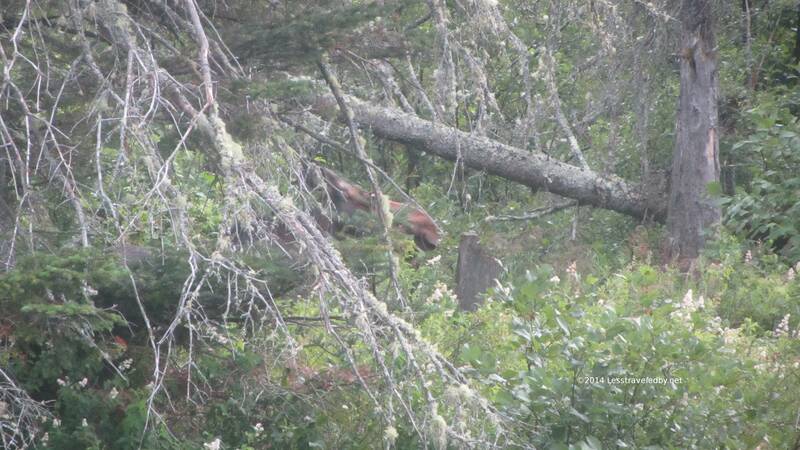 This was definitely a cow moose playing peek-a-boo with us for a while before heading down the trail. She finally stopped toying with us but continued to take her time. She really looked like she was putting on a show for the cameras. The big guy didn’t want her getting all the attention so he came back through crossing closer this time. Like I said, maybe I’ll see those waterfalls one year but I’m glad we stuck around to enjoy the show. 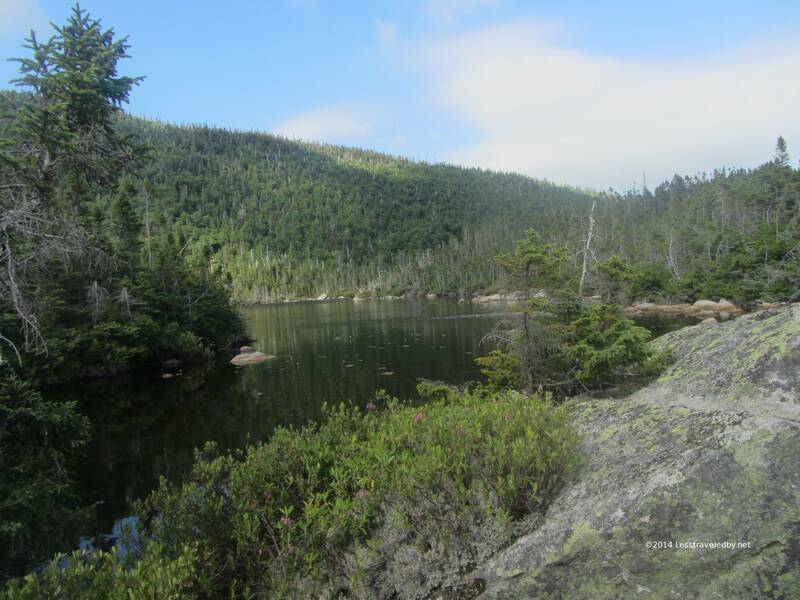 This view across Whidden Pond is always one of my favorite parts of the walk out on the last day. 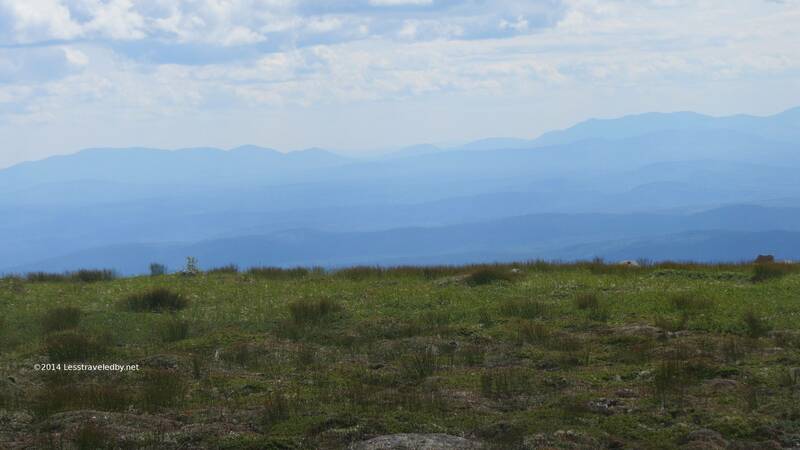 From this angle you can see Pamola clearly separate from Baxter, the top of the saddle and Hamlin from a distance that gives you great perspective. After going up that way, then down into the NW Basin and around Russell Mt you can look back on where the loop started with different eyes. These are the happy eyes of a man standing on the bridge in Roaring Brook. The decision has been made to stop for chips to hold us over until we can get to the cheeseburgers to hold us over until we can get home and make pizzas. I’m always happy with a plan like that and never more so than after a romp in the woods. 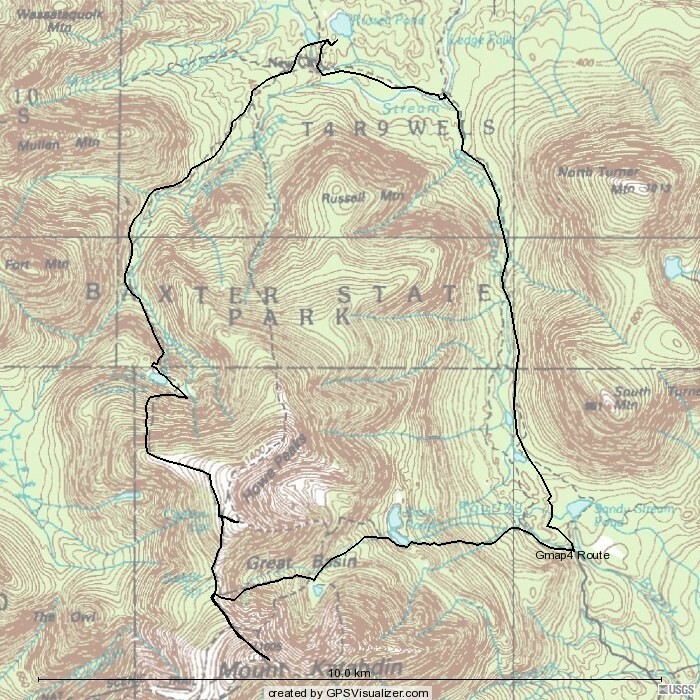 If you are thinking about doing this loop or any other adventure in Baxter State Park I advise you to do a bit of research before you go. 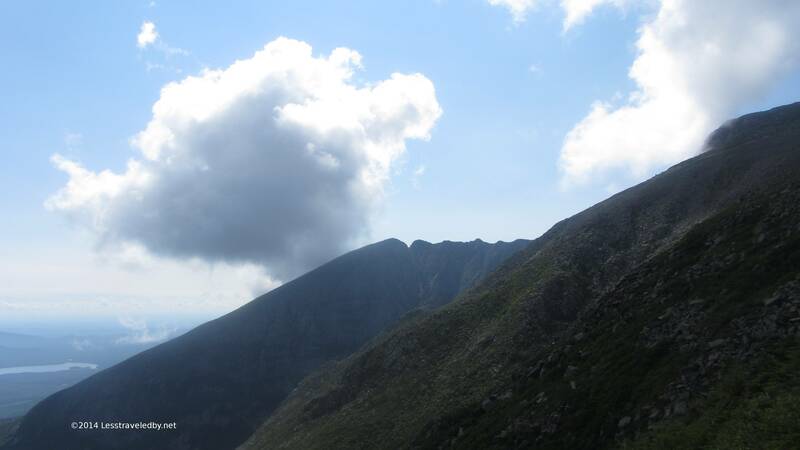 Reservations are required throughout the park for camping and for day hiking Katahdin from some parking areas. There are numerous rules imposed to protect the park and keep the experience as natural as possible. Make sure your plans fall within what is allowed so you don’t have any issues. Large groups are discouraged by design as one example. Some parts of the park are visited only rarely with no rangers or other staff making patrols so you will want to be prepared to self rescue if problems occur. In the truly wild places nature is not a guided tour and common sense is your best hope for survival. 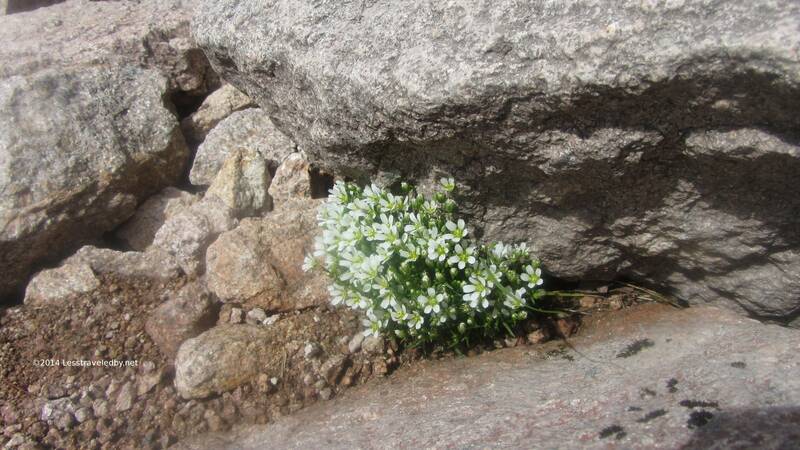 Weather is also very unpredictable in and around the mountains and can be quite violent at times. Lightning, high winds, flooding, hail and even tornadoes are possible threats in this area, though those pale in comparison to a full black fly bloom. Pretty cool. 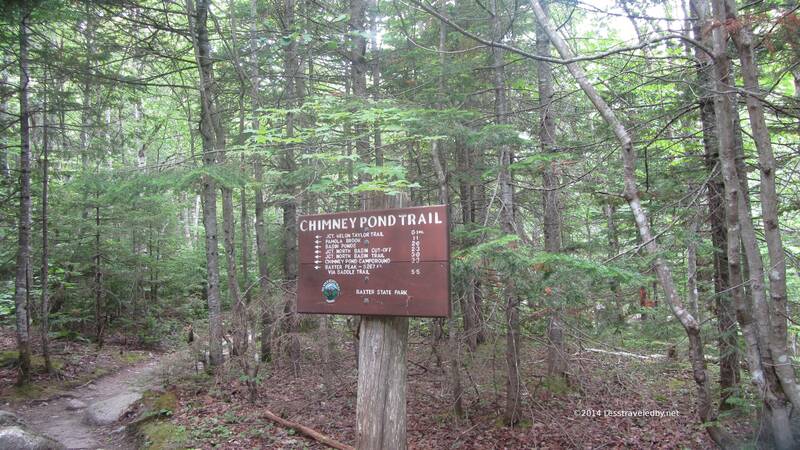 did the same back in ’64 but went finished from Wassataquoik Lake through Pogy Notch to South Branch Ponds. 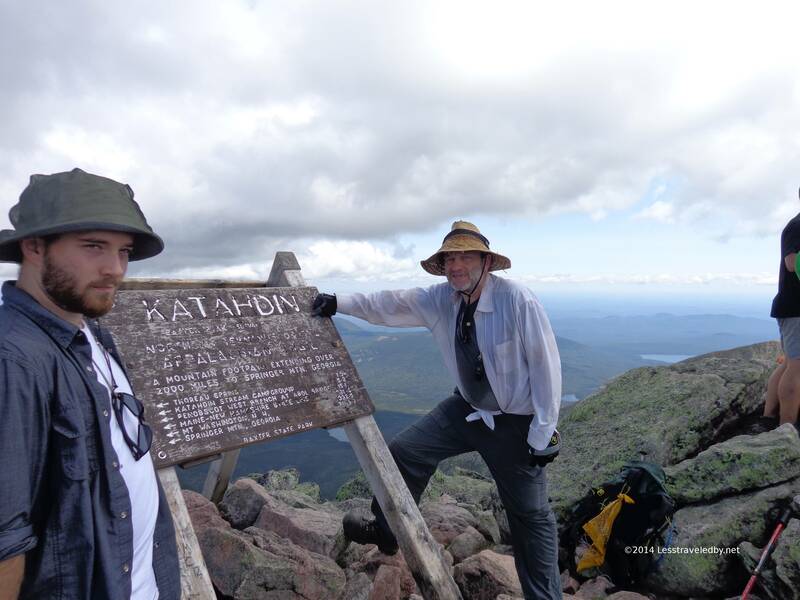 Started at Abol to Baxter Peak to NW Plateau. 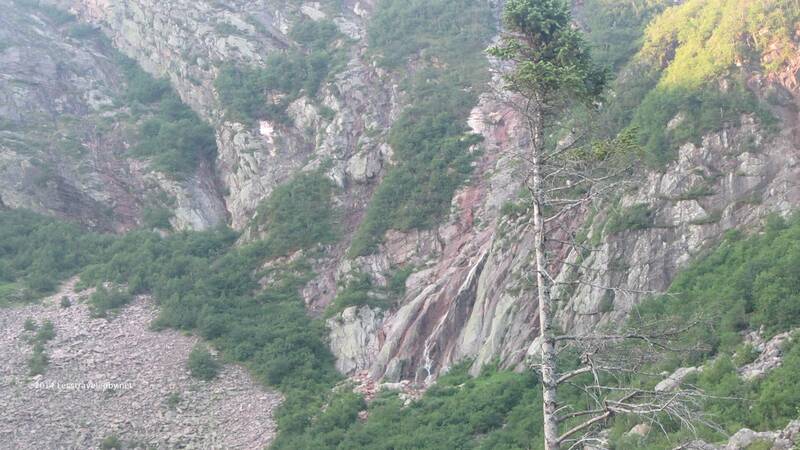 I just did the reverse route of this hike. 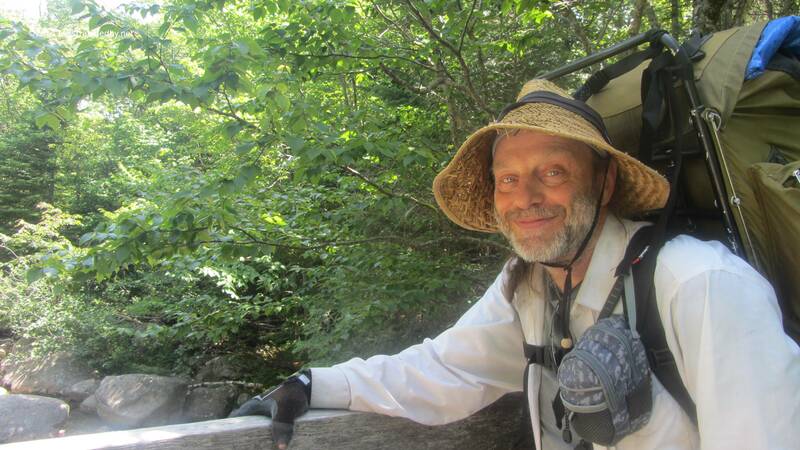 It was my return to Davis Pond after a many years absence. 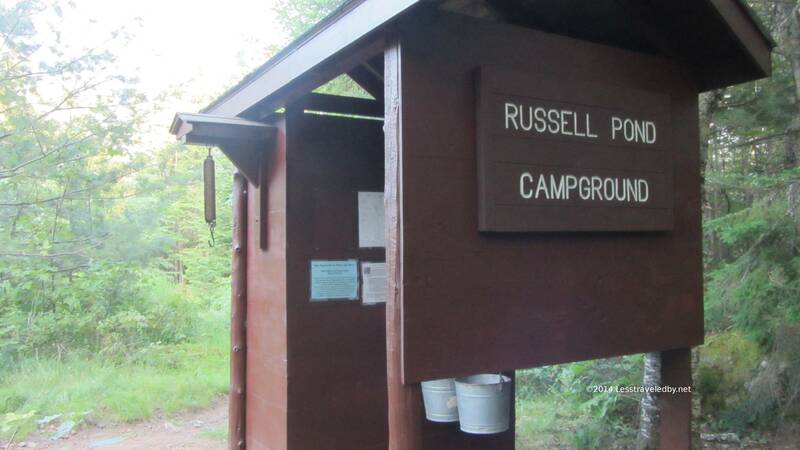 I planned a 3 day loop, staying at Russell Pond, on to Davis and then back to reality (my car) at Roaring Brook Campground. I arrived early at Davis Pond, just after 11am. I had a small, though not a cub, black bear visit. I shoo’d him/her away; happy to see a bear but happier still he left. Ten minutes later he returned, and another ten minutes after that he returned again. I decided I had enough time to make it to Roaring Brook before dark, so off I went, leaving behind the healthy black bear and Davis Pond. A three day trip turned into a two day trip; the views, the bear and the memories will serve me well till I return to Davis Pond. That is a shame Ken. Time at Davis is hard to come by and usually very peaceful. 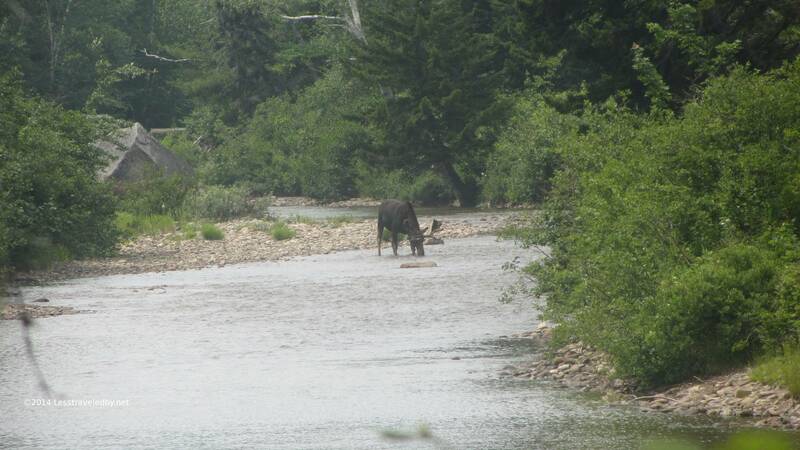 We had a cow moose come around the corner of the LT and munch grass at our feet on my first visit there. Must be something about the place that makes the animals want to come play with the people. I will be doing this exact trip next week. Good review as I have done the opposite direction 3 times. This will give a whole new perspective on the park. Lots of rain so the crossings will be deep 🙂 Have fun, but be careful out there! 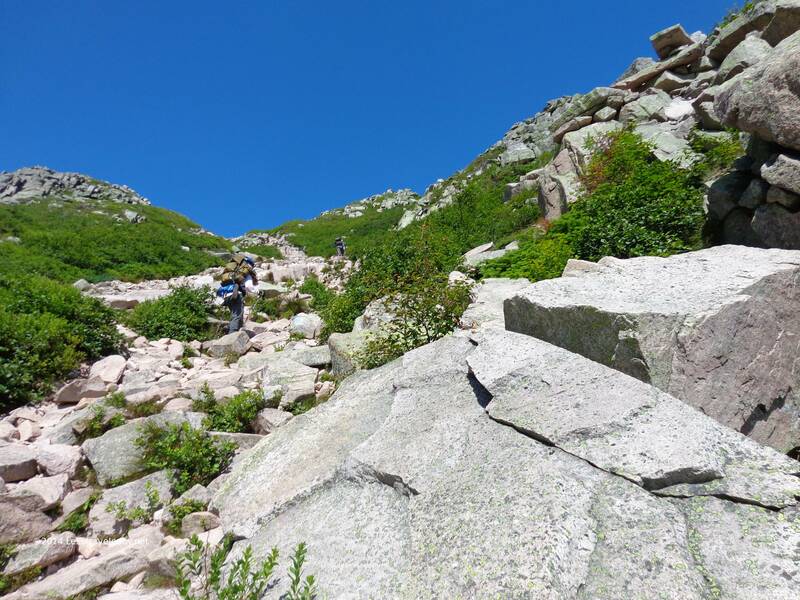 Did I pass you today 8/8 hiking to chimney pond? I was completing this loop from the opposite direction. Wasn’t me either 🙂 We were climbing Mt Mansfield in VT that day. Glad all you folks are enjoying Baxter trips though!! Well is was not me because I was out of the park by the 5th. All in all a great trip. Only had rain on the 4th (Saturday) after being in the park for 6 days and 7 nights. The Northwest trail was a bit wet but not running like it usually is.